Photos and biographical information courtesy of Paul Swendsen. A native San Franciscan, artist Paul Swendsen studied fine arts as well drama and a good dose of science. 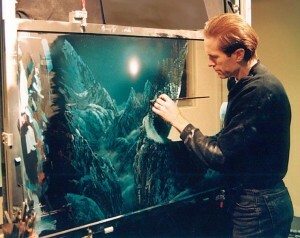 He began his film carrier at Colossal Pictures after directors saw his hyperrealist paintings. Later, he worked closely with Francis Ford Coppola to create the 1930’s style murals for his film Tucker. Matte artists from Lucas Film’s ILM watched him paint and he was asked to join the matte department for Willow (Ron Howard). Between films at ILM he painting book covers and so began his friendship with Arthur C. Clarke (2001 A Space Odessy, Rendezvous With Rama…). After meeting Clarke in Sri Lanka he continued traveling around the world eventually illustrating the covers for all of Clarke’s works as well as other Sci Fi authors. The first American in 50 years to work at the Babelsberg Studio (DEFA) in former East Germany teaching visual effects, he is a director, visual effects supervisor, and matte artist, combining traditional film knowledge with cutting edge visual effects techniques. Recently after 10 years in Europe he was back in the theater directing The Day Tim Stood Still which he co-wrote and co-produced with Welsh actor Carlton Bunce. The Sci-Fi pre-Big Bang spoof opened in Munich. 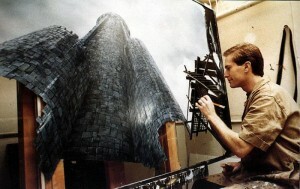 Paul Swendsen painting a castle for the film “Willow” . Final Analysis, Tucker A Man And His Dream, The Doors, Jacob’s Ladder, Ghost, Kurosawa’s Dreams, The Abyss, The Burbs, Roger Rabbit, Willow. 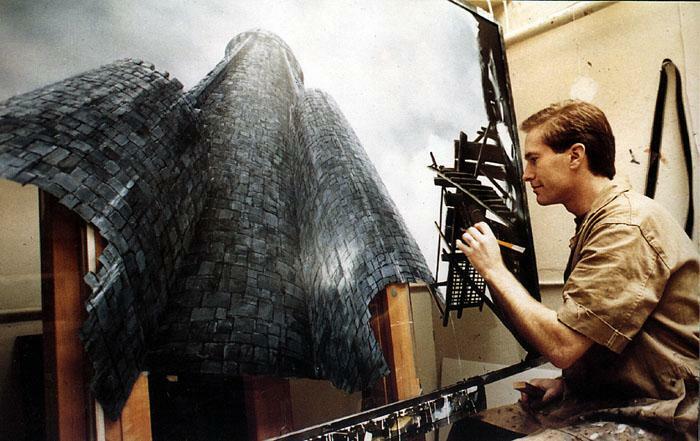 He probably holds the record for being the most uncredited matte artist in the business. • 1985 M.A. equivalence & teaching credential, California Community Colleges. • 1978 B.A., Art Plastics, San Francisco State University, Deans list. • 1976 A.A.,City Colledge of San Francisco. Posted on 26 January, 2014 by Domingo Lizcano. Permanent link.